I will not post anymore in here. But for your information, I will only put the news or info which I think are important, all diary and message (such as TOKTOK) will be post as long as there’s someone translate it and he or she gives permission to be posted on the other website. SS501 1st Asia Persona Tour’s charm travel across entire asia. SS501’s popularity increase because of leader Kim Hyun Joong. Mnet Japan will start to show reality show “We got married” which Kim Hyun Joong acted in from 1st Aug. 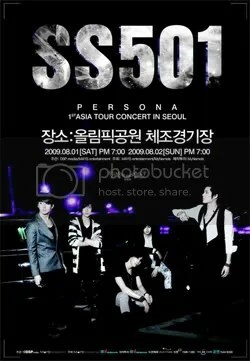 This program is an added bonus to SS501 publicity. Starting from 17th Aug, Mnet will also broadcast TV programs which SS501 participated in since they debut. It will be a half year program and will be named “I love SS501”. Since leader Kim Hyun Joong acted in popular korean drama “Boys Over Flowers”, the other members acting skill were also being discussed. Therefore, around mid August, another program “Break” acted by member Kim Kyu Joong will be telecasted. From September, SS501 members special activities in fan meetings, romantic sky will be telecasted. Other variety programs like “SOS” will start from October onwards. The next half year will be a busy year for SS501. The “Persona” Asia tour will continue to other Asia countries starting with Budokan, Japan. In the plans are Hong Kong & Taiwan on October, Thailand on November, Malaysia & Singapore on December. SS501 will hold their ‘ASIA TOUR in SEOUL, PERSONA’ for 2 days on 1~2 August at Seoul Olympic Park Gymnasium Stadium, and in order to show an even better image, they are practicing hard with AJ, who is the choreographer for Justin Timberlake and Usher.